Dr. Cio is the ultimate “goal-getter!” She uses her high energy to motivate people to take their first steps to success while nurturing the “littles” that keep our fears from letting us shine. Her proven track record shows how much she loves helping people reach all kinds of goals from running their first race, passing that test, landing that big job, making friends with our changing bodies, healing from trauma, or learning to love. You set the goal and trust that Cio will walk you to a new future. Dr. Cío Hernández is a LMFT (Licensed Marriage and Family Therapist) with over 20 years of experience. 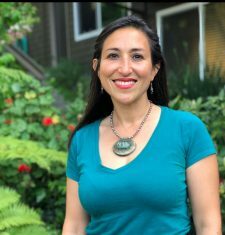 In her role as Mental Health Practitioner for the Marin County Department of Health and Human Services – Community Health and Prevention Services, Dr. Cío is accustomed to working with people from all walks of life. Marin County is the wealthiest county in California, yet there are great disparities between its communities. In working for health equity across many different communities, Dr. Cío serves as a liaison with the Marin County Board of Supervisors, sits on the Institutional Review Board for the Kaiser Foundation Research Institute, has acted as Chair of the Community Committee of the Bay Area Health Inequities Initiative, as well as the First Five Marin Children and Families Commission. Dr. Cío has significant experience in international projects. She has acted as a Consultant with the Russian Foreign Ministry’s law enforcement and public health delegates. She’s trained doctors and teachers in El Salvador, pioneered and chaired the Bi-National Health Week Initiative, conducted strategic planning, and worked closely with dignitaries from the United States, Canada, Mexico and nine additional Latin American countries. Dr. Cío also maintains a private practice specializing in EMDR (Eye Movement Desensitization Reprocessing), a well-researched, efficient, and effective technique that helps clients resolve distressing memories in a concrete way. EMDR offers a path to revealing and facing these memories, in order to break through emotional barriers, improve relationships, and excel in life. Dr. Cío uses EMDR to help her clients reach their personal and professional goals. Dr. Cío’s work also includes significant media experience. She appears on the cable TV health program “Marin Life” and the webcast “CONNECT!” on Maringchannel.org. She has been heard on NPR (National Public Radio), KPFA Radio, and other Bay Area radio stations. Dr. Cío has appeared on television stations, including Univision and KPIX CBS San Francisco. Dr. Cío has been honored with many awards, including the Marin Human Rights Commission’s Martin Luther King Jr. Humanitarian Award, the KQED Latino Heritage Month Bay Area Unsung Local Hero Award, and the San Francisco Foundation’s Koshland Civic Unity Award. She has also been presented with Certificates of Honor, Appreciation and Recognition by Senator Carole Migden, Mayor Gavin Newsom, Legislator Mark Leno, Representatives Tom Lantos and Barbara Lee, as well as US Congressman Jared Huffman. Dr. Cío has two bachelor’s degrees from UC Berkeley in Women’s Studies and Psychology. She also has a Master’s of Science in Counseling Psychology from Dominican University of California. Dr. Cío also has her Ph.D. in Health Care Leadership from U.C. Davis where she focused on anxiety, education, and health equity. Her faculty appointments include Dominican University of California, College of Marin, and Gerry Grossman Seminars. In her most important role as a mother, Cío enjoys learning from her college-aged son, coaching youth to do 5K runs, and being an auntie to her nephew and nieces as well as her other “village” children.